A ‘drunk’ husband was strapped to a pole by furious neighbours after he allegedly battered his wife and pushed her on the stairs. The 45-year-old man allegedly left his wife covered in cuts and bruises after beating her near their home in Bahia, Brazil. When neighbours were alerted to the incident, they detained him by tying him to a pole with green rope. Military police were called to the scene on Sunday night, where the traumatised victim, named as Maria Viana Santana Pereir, was treated for her wounds. Police say the woman had cuts and bruises and was bleeding when they arrived at the marital home in the town of Jacobina. She was taken to a nearby hospital, before being released on Monday morning. The husband was unbound and taken to the Jacobina police station, where he was charged and held in custody. 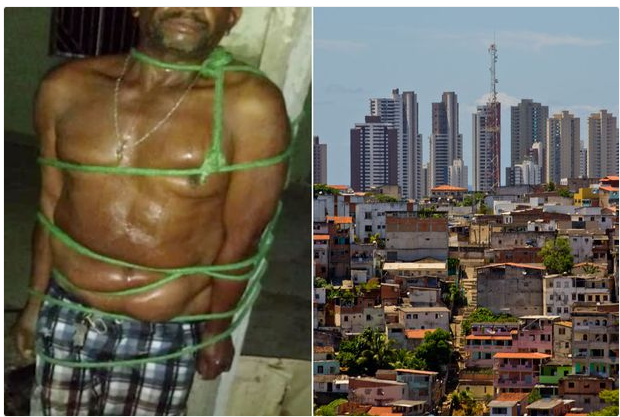 0 Response to "See What Neighbors Did To A Drunk Man After Beating His Wife To Pulp (Photos)"